Bewl had 14 entries today, ranging from J16, to IM3 and Masters D. All our Bewl crews gave great performances. Sam in J16 1X won his heat and semi, giving a gutsy race in the final losing to Reading. In the J16 2X Alex and Andrea had a fantastic race against a "Start' double composite from Twickenham/reading, just being edged in the last 50 metres. Our developing senior IM3 4X team-Ben, Will, Ed and Olli, won their heat well and came 2nd in their final to Molesey. The finale of the day was the winning WJ18 4X (Ashley, Hannah, G, Freya) who gave a great performance, well done girls. Kingston regatta is always a lovely weekend, sunshine and a fabulous part of the Thames. Our younger Bewl juniors had an eventful day today. The WJ13 4X+ Abbi, Biba, Martha, & Jess, cox Alex, won 3 rounds to get to the final, they fought hard against a larger Kingston crew and lost by 2/3 of length. A great day with lots to build on for next year, well done. 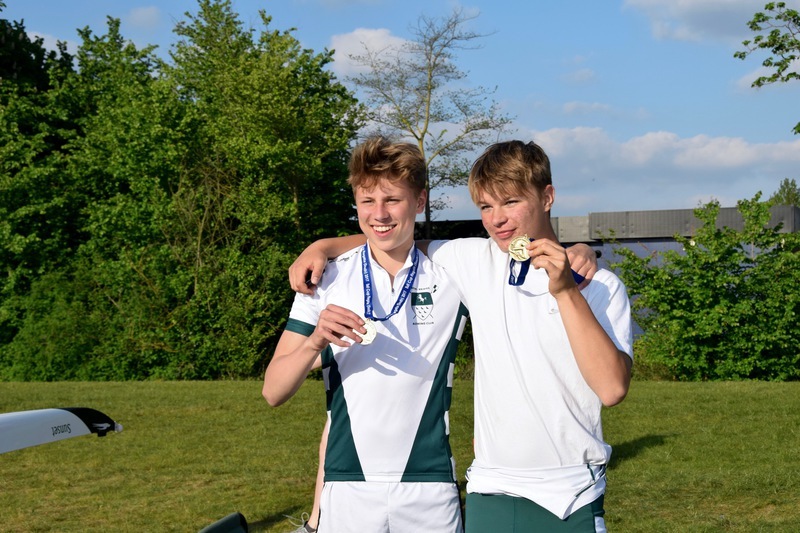 The J15 boys Alex, Alex, Ted and Thomas are showing some great potential, they fought competitively, gaining experience in racing and of the Umpiring flags!!... Well done everyone. Alex Morris, who learned to row at Bewl as a J13, has won at Henley Royal Regatta. He was at bow in the Thames "A" eight that won the Thames Cup. Closest race was on the Friday when they beat NSR Oslo by a canvas. The semi-final was a bit more comfortable, when they beat Leander by 2 1/4 L before winning the final in style on the Sunday by 5 L. Congratulations. Bewl's J15 4X+ competed at Chiswick today. With 7 crews entered in this event, the boys, Alex, Alex, Henry and Ted coxed by Biba did great winning their heat against Team Keane, and came 2nd overall, to a very drilled Tideway sculler's school crew. A big well done. 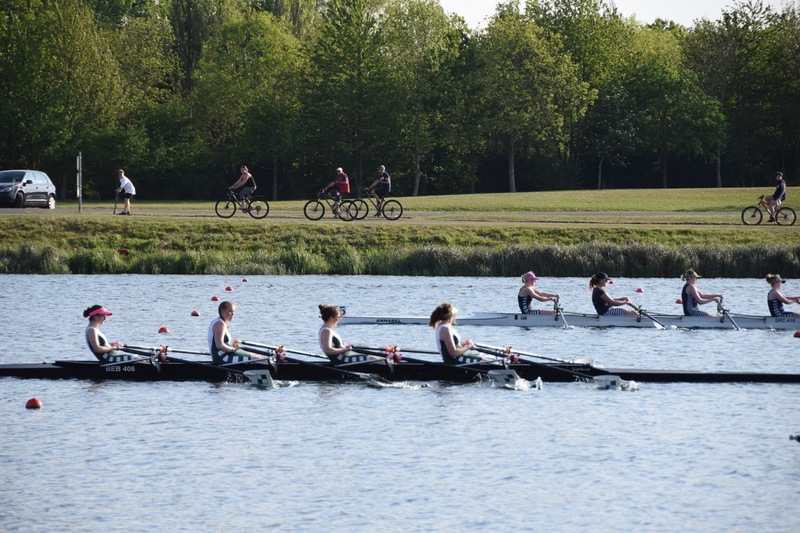 Bewl had crews in three events at Twickenham regatta. Colin, John, Rob and Roger raced in the Masters G/H quads event, and were up against Putney Town. The start was tricky from stakeboats on a bend of the river, and Bewl lost ground in the first few strokes getting straight again on the course. After that both crews sculled down the course at a similar speed, so Bewl couldn't claw back the gap. Later in the day Putney were the overall event winners beating Twickenham. Sarah and Jonathan, after their win at Nottingham Masters two weeks before, doubled up by entering both mixed masters D/E and also open (mens) masters E double sculls. First race of the day, in the open event, was the toughest. They held a half length lead all the way down the course in a tight race against Sons of the Thames. In the final they then beat Putney Town by a couple of lengths. Later in the day, in the mixed event, they won comfortably, first against a Sons of the Thames crew, and then a Twickenham crew in the final. With favourable weather and conditions, an interesting day out, especially when the afternoon high tide flooded the boating area and car park, and crews had to wade waist deep to launch their boats. A lovely stretch of the Thames to row on. On 20th May, some of the Bewl Masters Squad raced at Walton Regatta and picked up three wins. Racing as a MasC Quad (despite being MasD) – nothing like the extra challenge of age category and tackling a few buoys on route to take the win! The Quad then split into two doubles with Ben/Mike racing three times to win MasD 2x by a canvas in the final. Rod/Angus raced as MasC 2x and won comfortably (1L) vs Molesey. Bewl Bridge Rowing Club Junior Squad who have been developing, training and working hard over the past couple of years proved themselves today as a great competitive squad. A fantabulous well done. With favourable conditions and a tail wind, our crews produced great times. Well done everyone, you should all be proud of yourselves. A special well done to those at their first regatta, Oscar, Casper, Jo and Matt and Jonti. A fantastic event to take part in. 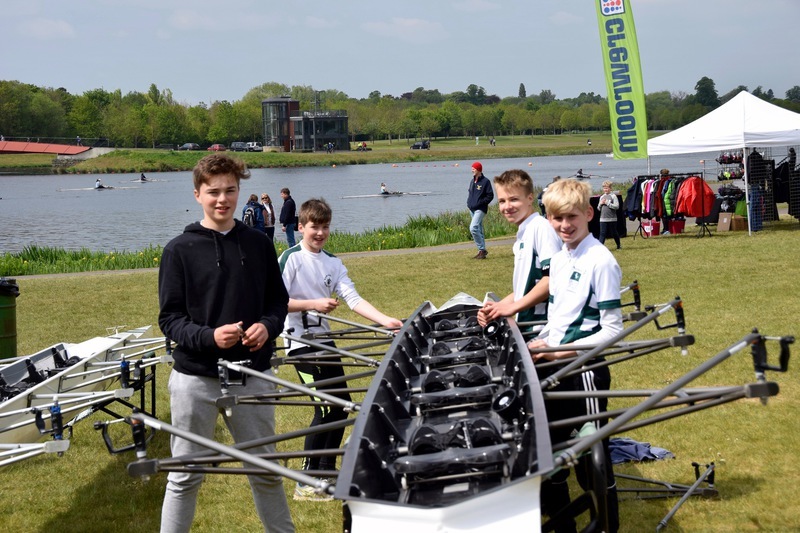 Congratulations to all BBRC Crews who competed at the Junior Inter-Regional Regatta, Holme Pierrepoint, Nottingham 22 April 2017. Benign conditions for the heats on Saturday morning. More Bewlish for the A and B finals in the afternoon, with a gusty cross-tailwind. Our Crews: J16 2X Tim & Sam, WJ16 2X Ashley & Mary-Jane, WJ14 4X+ Abi, Martha, Jess & Isobel, Cox Biba, J14 1X Will, WJ16 8+ Comp. our girls, Maryam, Alex, Myrtle & Saskia. We had our largest ever entry for the Spring Head of Bewl. The weather was fabulous and the water totally calm. Photos of all that took part are on our facebook page. There are some fun pictures afterwards where there are lots of smiles. Thank you to all the launch drivers, time keepers, Rob for organising and Christa, Lisa and Wendy for the tea and cakes. A day that started out misty and chilly, but ended up almost spring-like, saw a goodly contingent of Bewl Masters rowers descend on Molesey Boat Club, for an event known as much for the quality of the cakes as the thrill of the sport. Once rigging was done, we all repaired to the comfort of the clubhouse for a briefing and to watch the somewhat younger and fitter members of MBC and OUWLRC boat for some seat racing in their eights (sadly for Annie, no Mo Sbihi this time…). With a lot of crews to get on the water, and the usual last minute difficulties of finding the right spanner for some late adjustment, the marshal’s deserve credit for getting everyone lined up on the start. BBRC put out the Sunday VIII, ‘Colin’s’ men’sG4X and our boat, MxdD4X in a new configuration, with Jenny at stroke. This shift in order, on the advice of a visiting Dutch coach (scary!) served us well – we had a great first kilometre and pushed along (gaining leverage from a woe-begon MBC crew en-route) to finish as the fastest mixed quad overall (on raw times) and the division winners! A first win of the season and hopefully we can go faster when we just have to navigate straight lines! Good performances from the eight and the men’s quad justified the quaffing of a few jars of excellent ale. As is becoming traditional, we rounded the day off with a bite to eat and a bottle of red in a local hostelry before heading for home and more training…. A fantastic event to finish the calendar year. In near perfect conditions for December; dry, calm and not too cold. There was some great close spirited races bringing juniors and seniors together in the club. A special thank you to Lisa, Wendy B and Christa for organising the mulled wine, soup and hot chocolate. And to Dave, Rob, Miles and team for the organisation and supervision on the day. The biggest thank you is to all the 76 club members who took part in the festive fun. Bewl had 17 crews at Walton Small Boats Head. Walton Head had a massive 590 crews competing over 3000 metres in three divisions. Bewl's fastest crew, Masters C 2X: Rod and Hagen came 11th overall in a time of 10.59. Bewl had two wins, Master D 2X: Hagen and Angus, Master B 2X: Ben and Angus. The juniors had great experience at one of the largest Small Boat's Head in the country. Our fastest junior crew Ben and Ibrahim came 33rd overall. Well done everyone. An early start and a warming cup of coffee (thanks to Hagen and co) as we rigged ‘Piglet’ by Barnes Bridge, along with ranks of other hopefuls and not-so-hopefuls. This was to be our third outing as a crew (an hour on Bewl and a freezing morning at Docklands Head), so optimism was tempered by the reality that this was to be our first race together on the Tideway, something our steers (Richard Snowden) was definitely conscious of! The river turned out to be in gentle mood. A bit choppy before Hammersmith, but then sunny and docile. Richard steered an immaculate Surrey bend and we found ourselves pulling well clear of the mixed 4X behind us, but chased by a soi-disant F 4- from Star (average not always being fairly represented by the median). They gave us a good race to TSS where we found our style cramped by a slow crew from UTRC and the piers of Chiswick Bridge. We came away happy with a time of 20.11, having rowed over at a consistent split and a rate of 29-30. Beer, wine and a fish and chip lunch at The White Hart (while the traffic on Dukes Meadow cleared) made for a great day out. Now to get down to some serious training! Two Bewl quads made it to the Veterans Fours Head on Remembrance Sunday, a day that was much better than the very unpleasant conditions experienced at the Fours Head the day before. No rain, a bit of sun and even only a slight breeze made hanging around at the start for the 2 minutes silence feel positively summery, and the course itself was much better than the Pairs Head a few weeks ago. The Head was run in the opposite direction from normal, from the Mile Post to Chiswick Wharf, about 650m above Chiswick Bridge on a very fast incoming tide, with the fastest crew of the day posting a time under 17mins. Leading the charge for Bewl was the MasD 4x of Angus, Mark, Rod and Hagen who were defending their 2015 win in the same event. Going off first in the group of MasD quads, they passed a steady stream of MasC4- who were no match for the speed of a swift quad, leaving the chasing MasD quads well behind. After navigating through the logjam just before Chiswick Eyot, they then had a clear run to the finish. The feeling amongst the crew was that it was an excellent row, much better than the previous year, but there was one other crew from Walton with good pedigree that would be the danger oppo, and who started at the back of the class, way out of view. Sure enough, whilst Bewl recorded an excellent time of 17.45, the Walton crew were the class victors by 12 seconds, leaving Bewl in second place in the class. Bewl's overall position in the Head was an excellent 9th, well up on last year. Winter has certainly arrived, it was windy and bitter. The course 2750 metres long, rowing with the stunning urban background of Canary Wharf, from Victoria Dock through to Albert Dock. Bewl had 19 crews racing in challenging conditions. Well done everyone, especially to Matt and Jontie in their first J14 2X event. Also to Mary and Ashley for winning WJ16 2X. Mike Maunsell, Jonathan Morris and Sarah Morris raced at Henley on 5th November. The 3,000m head course was upstream to the royal regatta finishing line and there were over 500 entries in total. It was a very cold and blustery day making the wait at the start a challenge, although at least it remained dry. In the morning the Morris mixed double raced in a masters B/E handicap race and won by a comfortable margin over their masters B opposition. In the afternoon division (when James Cracknell was seen in the masters C singles section) Mike raced in the D singles, but was up against very strong opposition, with the winner being an ex-olympian. Jonathan raced in the E singles, and finished in the middle of the strong field. Sarah's opposition in masters E did not appear at the start, but she beat all the B, C and D single times, ie was faster than all the scullers in the three younger age groups. Full results details are available on the Henley Sculls website. The Head of Bewl took place in glorious rowing conditions. 68 Bewl members took part (of whom 37 were juniors) in 22 boats. The course was 4000m long, racing from Hook Straight to Rosemary Lane. The crews were a mixture of Masters, Seniors, Juniors and Junior development squad. The Junior development squad racing in an octuple and quad did brilliantly, for most, this was the longest piece of continuous rowing they had done, and as an internal head was great experience on how Head of the Rivers are organised. Well done. Our National Champion Masters D 2x covered the 4000m course in 15min 19sec to win the Head of Bewl trophy. The Best Performance Junior Boys trophy went to Tim and Sam, The Best Performance Junior Girls Trophy went to Ashley and Mary. The fun wooden spoons award went to Alex and Myrtle, taken with great spirit and delight. The Head was followed with a fantastic spread of cake and soup. Well done everyone. On Saturday 22 October Bewl had a big BBRC clean up. The boat house was swept, brushed and dusted, and the boats cleaned and sorted. Thanks to all the juniors and seniors who helped, and an especially big thank you to Annie and Paul for the BBQ. Great team work. Also on Sunday 23 October a big thank you to everyone who came along to the John Northridge boat naming ceremony. It was great to see and meet John's family as well as some of his old rowing buddies. Thank you to all the junior families and senior members for the fantastic cakes and Peter for the bubbly and Arena Gold apple juice, went down a treat. John Northridge was one of the founding members of Bewl, so we have him to thank for our enjoyment of the sport at Bewl. Three scullers from Bewl raced at Weybridge on an upstream course of 3,300m (similar to Walton Head but in the opposite direction). 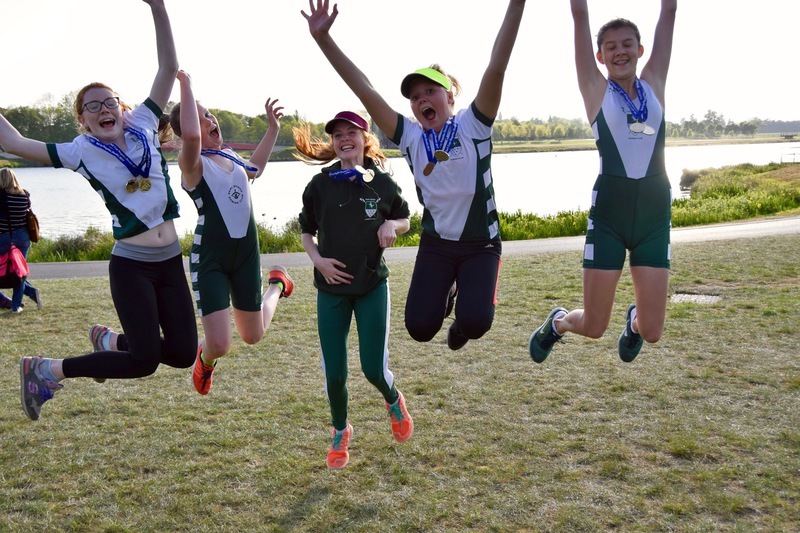 Full details on the Weybridge Rowing Club website, but some good results for Bewl. Mike Maunsell came 6th in a strong Mas D 1x field. Jonathan Morris won Mas E 1x by 3 seconds in a close contest. Sarah Morris won W Mas C/D/E 1x by 58 seconds. Five crews from Bewl raced at the Pairs Head with some strong results (see Pairs Head website for full details of results). Well done to all. Bewl had a fabulous day at Maidstone Autumn Head. We had 27 entries, probably the largest Bewl entry of recent years, ranging from J13 to J18, Novice and Masters. We had 4 wins: J18 single Seb, WJ16 double Ashley and Mary, WJ18 double Ella and Freya, WJ18 4+ Hannah, G, Ella, Freya, cox Alex. Wells done everyone. On Saturday 24th September three scullers from Bewl entered Wallingford Long Distance Sculls, which is a popular head race over an upstream course of 4,250m. The course is quite scenic, but with some tricky bends and overhanging willow trees - as well as the odd cabin cruiser. Mike Maunsell , Jonathan Morris and Sarah Morris entered in their singles in Division 1, which had 260 crews in various categories. Such a large entry meant a long wait up at the start, but several hours later the race was eventually under way, and at least the weather remained dry. On this occasion the men didn't return with any silverware, although witnessed a couple of other scullers capsize dramatically on the course and encounter hazards such as the odd sculler embedded in the bank. However, there was Bewl success when Sarah won Womens' Masters E singles by over two minutes in a time of twenty minutes and seven seconds, as well as comfortably beating the time of the age category below. On Sunday 4th September Bewl entered two crews into the Ouse Marathon which races 21.6km on the Great Ouse from West Norfolk Rowing Club in Denver, Norfolk, to Ely in Cambridgeshire, on a meandering reed-lined course that is fairly demanding for coxless boats. A further challenge this year was that the wind speed was gusting at up to 31mph and it was a cross wind/slight headwind which meant that boats were buffeted a lot, especially during the second half of the course. The Bliss/Suthers Mixed Masters E pair finished in a very respectable time of 2 hours, 1 minute and 9 seconds. Conditions meant that their previous record time from last year was not under threat, but they still beat eight other doubles and pairs of various ages/categories. The Morris/Morris Mixed Masters E double won in a time of 1 hour, 36 minutes and 27 seconds beating all other masters mixed crews of any boat category or age and setting a new record for their category. The Isle of Ely Rowing Club organised the whole event brilliantly, including excellent refreshments at the end, and the 160 crews that entered all had a great time (honest). Why not try it next year?